"Avangate provides a “one-stop-shop” which gives us the flexibility we need to build the types of offers that appeal to our target audience. This includes trying new subscription models, pricing and packaging and sales support in 120+ countries. In addition, it's a huge relief having global payments, tax, fraud, etc. taken care of so we can focus on our core business instead of spending our resources managing a commerce infrastructure. 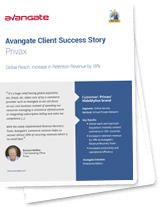 With the newly implemented Revenue Recovery Tools, Avangate's commerce solution helps us recover almost 20% of recurring revenues which is no small feat", Danvers Baillieu, Former Chief Operating Officer, HideMyAss, part of Avast Software. HideMyAss is the parent company behind HideMyAss.com, a virtual private network with 10 million users around the globe. Increased Productivity and Operational Efficiency: global payments, tax, fraud, etc. are taken care of by Avangate so HideMyAss can focus on their core business instead of spending resources managing a commerce infrastructure or integrating subscription billing and sales tax compliance. Download the full HideMyAss case study here.